The first Sacrament of Initiation is a joyful event for the many generations of a family. It is a time for the parish community to welcome a new member to Christianity and renew the faith commitment of the parents. Through Jesus Christ and the power of the Holy Spirit the new young Christian is freed from sin and joined to the church. 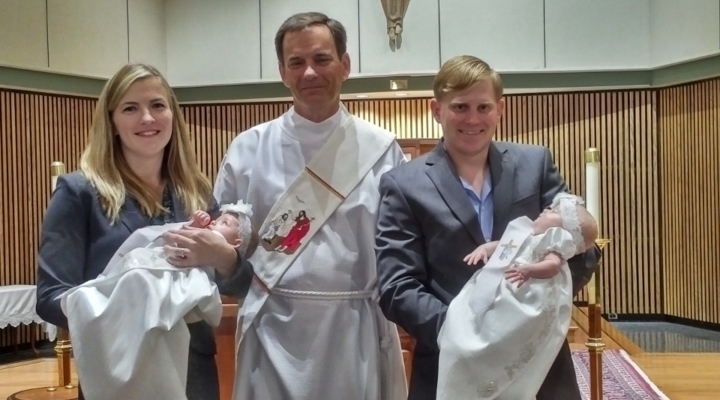 Children under the age of seven are presented by parents and Godparents for Baptism. In doing so, the adults speak for the child in professing the faith. Solemn promises are made to faithfully continue the formation of the child in the Catholic Community. Parents who ask that their child be baptized are invited to participate in a process that will help them fulfil these promises and equip them to grow as a Christian family. Regular Mass attendance is expected along with meetings for parents and godparents. School age children will attend Mass with their parents and participate in the Children's Liturgy of the Word. Additional instruction for children will occur through family faith formation in the home. Children over seven will also be prepared to celebrate their First Eucharist.